Matthew offers mentorships and individual training to Rolfers , Structural Integration Practitioners and CMT/LMT’s.. If you are a bodywork professional and interested incorporating structurally oriented soft tissue work into your practice, please inquire with Matthew ( rolf@matthewsi.com ) regarding details. Advanced Methods of Bodywork workshops combine myofascial techniques and structural principals from Dr. Ida P. Rolf's lineage of Structural Integration. These theories have been synthesized and focused for specific body segments and conditions. These classes have been popular for CE credits amongst health care professionals (CMT/LMT, Rolfers/S.I. Practitioners, P.T., D.C. O.T.) who are looking for high quality trainings to maximize their therapeutic results. 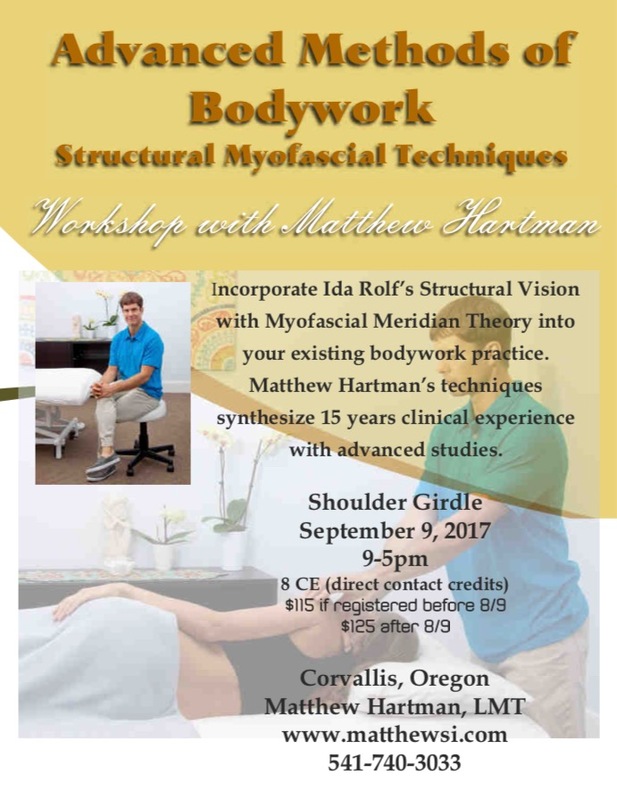 "Matthew's class on the shoulder girdle was the best CE class I have ever taken! I returned to work on Monday with an arsenal of new side-lying techniques to immediately help their shoulders and neck. Matthew presents in a nonsensical, yet precise manner which is empowering to an LMT as myself."